Farmshop Marin is Jeff Cerciello’s second outpost which opened in 2013 in the heart of the Marin Country Mart in Larkspur. It follows in the footsteps of Farmshop Los Angeles, the acclaimed restaurant and artisan market that opened in the Brentwood Country Mart in 2010. Farmshop Marin features its signature fare of pristine California-centric ingredients and refined yet comforting dishes. The impressive 6,500 square foot space features a comfortable and elegant dining room, outdoor patio, expansive full-bar area seating 50 people, a lounge, a private dining room seating 60, and an open-hearth wood-burning oven and grill. A new gathering space for Marin locals & ferry commuters, the restaurant offers the impeccably-sourced, seasonal California fare Farmshop has come to be known for, with additional pizza, fish and meats fresh from the wood-burning oven and grill. 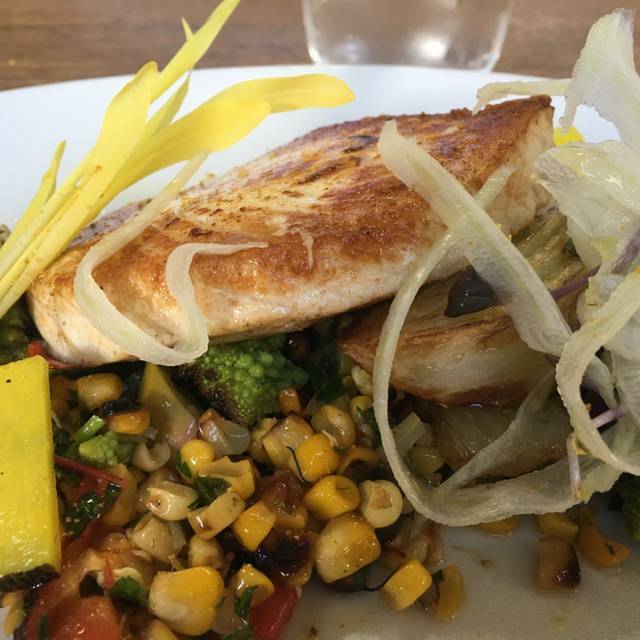 Farmshop Marin serves lunch and dinner daily, and has a vibrant bar scene daily until close. Whatever your needs, Farmshop can accommodate. We offer a private dining room with capacities of up to 60 seated or 100 for a standing reception. Full buyouts of the restaurant are also available with a capacity for 120 guests seated or up to 300 for a standing reception. We also cater! Farmshop can offer everything you need from Catering to a Private Events room that can seat up to 60, Restaurant Buyout opportunities and Off-site Events. We can arrange for a sit down dinner served family style, or a mix of a buffet and canapes for a standing reception. Call us, we will design a personalized menu and take care of all the rest, from rentals to labor. The Marin Country Mart offers ample parking for all of the Mart's guests. The Jadori chicken was undercooked. Chefs know that chiken takes at least 45 minutes to cook properly. So I had to send it back. The avocado hummus was good. Not "OMG!" The tomato salad was bland. It's heirloom tomato season why not get those! We do have local farmers that deliver. I don't think we'll go back again. Anniversary dinner was lovely. Only setback was it coincided with a movie night just beyond out seating. That and a blaring setting sun put a blemish on otherwise delicious meal. The food just wasn’t good. Rock fish for 2 - wrong dish first... right dish but oddly seasoned... GF and I both felt ‘not right’ afterword. We lived in Larkspur Landing for 4 years and had a bit of a love hate (well never really hated) relationship with FarmShop. The plus side is that the staff are friendly and welcoming and the location is great. The BYOB policy is fair ($25) and the drinks selection is extensive. The issue we had is the limited and unchanging menu and the pizzas. I feel that the menu could offer so much more - and I appreciate the cooking style and kitchen layout but the choices are limited and don't change enough. The pizzas are expensive and every single one I have had has been tasty but always burned on the edges (huge burnt bubbles) and really undercooked/soggy in the centre. is this really the style of cooking that you're aiming for? Sadly no longer living in Larkspur so no more FarmShop for us - some happy memories but mostly feeling it could be so much more. Excellent food. Portions are 'right sized' versus overly-abundant. Flavors and ingredients are amazing, as well as food prep. One of our entrees revealed a small undercooked portion, but overall the entree was excellent. Good 'textures' and combinations of ingredients. I'd definitely recommend, but don't expect abundant portions. Great restaurant with even better food. We were blown away with the overall ambiance of the space. You can tell every corner was carefully designed to create an overall farm to table meets nautical feel. The service was excellent, everyone from the host to the bussers were attentive and polite. It's amazing what good, professional service does to an overall experience at a restaurant. Last, but not least of course, was the food. What a refreshing meal we had, each dish was a work of art, beautifully presented and the portion sizes were fair. This restaurant is what farm-to-table should be. Everything was so SO fresh. They were careful to point out local farms, and really tied the menu together with in-season produce. We loved it so much we made another reservation for next week. The menu was delicious as always, perhaps not as many varied meat choices. Our choices ended up being vegetarian by accident~bread, cheese and hummus. We were between 2 extremely loud tables and it was hard to find our waiter when we needed although being in the path of everyone spilling out of the kitchen. Our water and plate clearing guy was very sweet. Although I requested a booth, as have done before, did not get it and it was a Birthday celebration but they didn't notice or bother to check in so it was kind of dinner as usual on a busy Friday at 6:15. No one acknowledged my husband’s birthday when I am fairly certain I added that note when I made the reservation. The $98 porterhouse entree we shared was frankly not worth $98. It was chewy, not tender. Disappointing. Extremely overpriced for the meal. Appetizers were much better than the entrees. Wine mark-up was excessive. No reason to go back. Ken took VERY good care of us! Great, amazing experience will be back! This was our second visit and it was just as good as our first. Every dish is thoughtful and uniquely designed, and the ingredients are obviously super fresh. The atmosphere is vibrant but not super noisy and the service is great. We ordered a mix of apps, mixed drinks, wine and 4 entrees and every single thing is something I’d order again. Absolutely worth every penny. Perfect for a reunion of friends. Good wine choice. Russel was great and our server was excellent ! I dine at farmshop often as the menu never disappoints and i can drink yummy, old world wines. I am in the wine business and appreciate value and sophisticated wines. Lovely, sophisticated, and delicious. Service was attentive, warm and hospitable without being intrusive. And the food was truly superb! Our French guests were impressed by the creative menu, fresh ingredients, and beautiful presentation. A unique California restaurant...unusual menu younwon’t find elsewhere. Hamachi and oysters were amazing. Great female server. Great food as always. They didn’t rush us which was perfect. Love this place. We like sitting at the bar so in the reservation I asked for a bar spot and they accommodated it. If you have a dairy intolerance you’d need lots of modifications. I had requested inside seating, but we were told request could not be accommodated because of a large party. Outside, I was seated facing the sun. It was noisy from families with children. Eventually, we were given a table inside. I would normally rate the food as excellent but did not feel the same quality for this visit. Great service. Stephanie d Josh are amazing. Management sharp. I had a great meal of the harissa carrots with dates (excellent), broccoli (pretty good), octopus (pretty good), and the pork chop (very good, huge portion - maybe even too big, not enough veggies on the plate though), but the service was terrible. we were checked on 1 time and it took 30 minutes+ between appetizers and entree. My friend had the swordfish and her portion was 1/3 the size of my pork chop. A bit overpriced as well. I've been here many times and the pizza/apps is really the way to go. You do sit nicely and the ambience/atmopshere is good/lively. The pricey menu keeps us from coming back as often as we'd like, but it's really one of the better places in the area. our server was extremely personable and knowledgeable. She made sure all our questions were answered and we're satisfied with each dish. My husband had the watermelon and tomato salad and the pork chop and I had the mixed green salad and swordfish. Both were exactly what we wanted. Food in Marin is not very special but Farmshop is. The food here is amazing!! We ordered a burrata and fig appetizer and then each ordered our own pizza. The food was astounding. Best I've had in a looooooong time. Wonderful mix of flavors. Would definitely return for a special occasion. Always an interesting and diverse menu, the octopus ceviche starter was divine! Food was not to the level that the bill was at. $300.00 dinner for 4, which were 3 pizzas and a steak. Looks to be way over rated for the money that was required. First our waiter was one the most charming young men I have ever had the privilege of having as a waiter. Celebrated two wonderful birthdays with one amazing dining experience! Great place. Stuffy as in needs better air conditioning. If I'm in larkspur I'd definitely return visit, but I'd not make a special trip from SF just for this restaurant. On that note the food was well prepared, high quality ingredients, and relatively efficient service. We had a beautiful lunch here on the patio with friends. We started with wonderful pizza, shared avocado hummus, salad, wild salmon, olives and a lovely bottle of pinot rose. We then shared ricotta cake, chocolate tart, and mint meringue for desert. The service was excellent and unobtrusive, the food was fresh and tasty and the patio was a bittersweet place to bid goodbye to summer. We'll be back. Great meal and service. Only suggestion is that shades are added at the sides of the patio. Love the outdoor ambiance but for a second time in a row we have had to move because of sun and heat. Many other diners relocated as well. It's a shame with such a good outdoor venue. This is a favorite fall back restaurant for Marin County residents who want to meet Berkeley friends halfway for dinner. Unfortunately, on this occasion our table was not ready at the time we reserved and we were forced to stand for half an hour at the bar. I realized I need to find a new halfway restaurant.